We are all artists, sculpting and painting our way through life, creating a new future for ourselves each day. As living pieces of art, we are each more beautiful than any other art known to man and deserve to flourish as true and loving expressions of ourselves. The art is within each of us, which is why two people can view the same object or situation and have completely different experiences. Unfortunately, we sometimes see ugliness in the form of war, poverty, murder, prejudice, abuse, and senseless violence. However, as the artist of your world, you are by default the artist of this world. It is time to smash the old paradigm of hate and fear and use the broad strokes of love to erase the world’s pain. The world is our canvas, and we are responsible for what we create, be it a clean and healthy environment, an able supply of food and water, economic and political fairness, or freedom from violence and tyranny. This world is not hopeless; it is just in the hands of bad artists. It is time to remove the brushes from the hands of those who create works of selfishness, power, and greed until they can use their talents for the good of others. Many of them began their journey wanting to paint a better world,but got caught up in a fear-centered experience where the desire for money washed out the beauty they would otherwise create. However, the artists seeming to control the canvas, along with the paint and brushes, are greatly outnumbered and out-powered by the artists painting with their minds and hearts. It is past time for these humble and passionate ones to be too afraid to pick up their brushes for fear of failure or retaliation. We all have the inalienable right to create works expressing our inner beauty of love. By expressing it within ourselves first, we empower ourselves to share it with the world. Banding together as artists for humanity, we become stronger and more productive, and watch as the canvas begins to display the masterpiece of love and peace. How do you want your art to be known? Look around you, your creations are everywhere. Do they reflect that greatness and love you have within you? Do they bless others and encourage them to bring out the best within themselves? Or do they reflect a set of selfish obsessions founded in your fears? 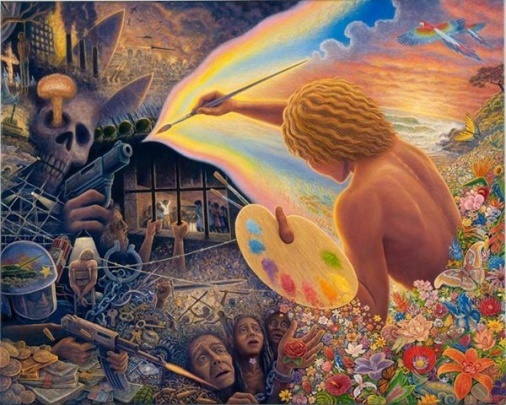 You are the artist, get busy painting a beautiful world for everyone to enjoy.